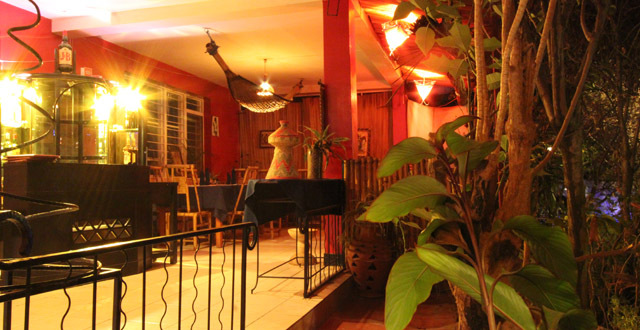 La Galette is the secret garden of Kigali eateries. The combination restaurant, butchery, bakery, and market, (and bar) is tucked away in a quiet corner downtown. Because its location is hidden in the city’s maze of a layout, La Galette is a treasure to those who can find it. When I finally found this mysterious La Galette for the first time, I was pleased to find the food lived up to its reputation. They make a better burger than most. The meat is seasoned nicely and has chopped up onions and garlic and probably magic in it. Savory! I’ve gotten a stale roll before but usually the bread is fresh. (A combination bakery and butchery is an excellent place to get a good burger.) The burger is rwf 2,200 and comes with a small salad on the side. I usually skip chips but for the sake of a proper tasting of La Galette (and nicer looking photo) I took them the last time I went. They were excellent; not sopping in grease like most I’ve had in Kigali. I forgot just how good their chips were. Unfortunately, I also forgot they don’t come with the burger. 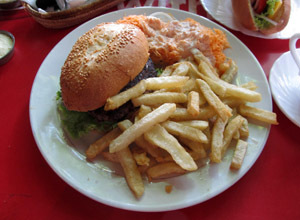 Chips cost rwf 1,200 but are absolutely worth adding to the meal! Drink prices are reasonable. A good trick is buying a water in the market and bringing it to your table because for some reason they mark up the price on the menu. I wouldn’t call that move stingy. That’s economical. La Galette is a lovely spot for breakfast. Those with a flexible schedule (or no schedule) can enjoy a quiet morning with a good coffee or omelet on the patio. All seating is outdoors but most tables are under shelter. There’s also a large tree in the middle of the patio that casts patchy shade over tables making dining all the more charming! But take care, it’s enchanted by a wily Nymph who drops leaves in drinks. La Galette is known for it’s great butchery and bakery. They have a nice produce section too. Find an array of fresh fruits and vegetables washed and wrapped in plastic for shoppers’ convenience. They have a nice selection of groceries and imported goods hard to find elsewhere. A few of the things that caught my eye when I looked around were Lea and Perrins worcestershire sauce, apple sauce, Philadelphia cream cheese, and those delectable danish butter cookies in the blue tin. 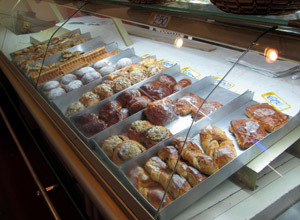 These items may be elsewhere in Kigali but they are all under one roof at La Galette. There’s also a nook of wine and spirits. I’m looking for someone to go in on one of the huge jugs of wine with me. It took a few blind tries before I actually found this place. Part of me thinks this gem deserves to be uncovered in a good adventure. If a quest is what you want, wander around downtown until you find it and feel free to disregard the following information. SPOILER ALERT: I’m about to tell you exactly where to find La Galette. From town head to KCT from the Tigo roundabout so that you’ll pass it on your left. Take the first right (that goes past the new T-2000) and continue on that road. It curves to the left; just continue on. Take the first right, downhill. Look on your right for a grand arch reading “KIOSQUE HAPPYNESS.” You’re so close! Turn left into the gravel parking lot a few meters further… La Galette is straight back through the parking lot! There’s now an Access Bank in the lot making the location easy to spot. An even more direct (less fun) way to get there from the main roundabout is to take the road that passes by the main bus park and prison. Directly across from the main prison gates is a road on the left. Go up that hill roughly 50 meters and you’ll find that Access Bank sign. Turn into the parking lot, you’ve arrived! If on the hill you pass KIOSQUE HAPPYNESS, you’ve gone just a few feet too far. It’s easy to find when you know what to look for. Reared in the Pennsylvania wilds, I acquired a natural curiosity for the world around me. In early 2012, I packed my bags, bid farewell to the Shire, and returned to roll in the hills. A renaissance woman of mediocre ability, I'm continuously pursuing all sorts of projects and turning over rocks as I find them. I’m enjoying the journey and maintaining that every day is a good day. Email me at lia@livinginkigali.com.